My cats love to play! They have many toys that they enjoy, toys that bring out their inner kitten the moment I take them out of the toy box. My cats are very spoiled. Fortunately, when I adopted my cats, though they were thin and scared being at the shelter, they received great care there. But there are many cats out there who don’t get tho same love, and many ferals who aren’t fixed continue mating and increasing the feral cat population. One of the people I met via my cat’s Instagram account was Becky from Birds of a Sweater. 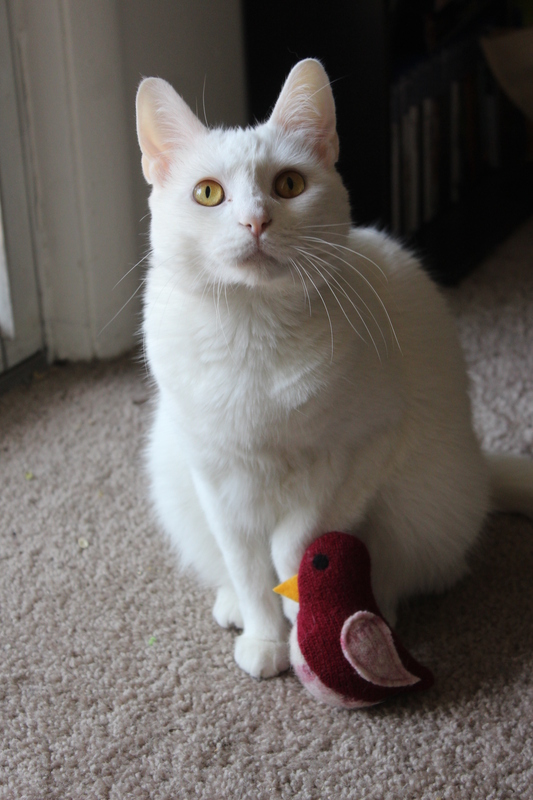 Her company makes adorable bird toys for felines from upcycled sweaters! When I first saw them on my feed, I couldn’t get over how cute they were. And not only are they made from eco-friendly, but part of the proceeds helps cats in need! I’m doing a Q&A with Becky in this post so you can get to know her company more. We’ll also be doing a giveaway with similar toys to those seen in this post and video. All you have to do to enter is follow @BirdsofaSweater, @StephanieSokol and @FreedomandLibertyCats on Instagram, then post a photo of your feline using the hashtag #FreedomsBirdsofaSweaterGiveaway, for a chance to win! 1. Birds of a Sweater has been around since 2009. How did it get started, and where did the idea come from to create the birds and other cat toys? I started the Etsy shop in 2009 with my two sisters – the shop was originally called Three Sassy Sisters and had nothing to do with pet products! We all just sold things we were already making – headbands, aprons, etc. – it was pretty random. One of my sisters started sewing cat collars for her own cats and added those to the shop, and I started adding needle felted cat toys to the shop soon after that. The birds were a happy accident – I had some pieces of wool sweaters laying around that I was using to make headbands, and my cat seemed to love the feel and smell of the wool. Birds of a Sweater cat toys were added to the shop in 2010. Shortly after that we changed the theme of our shop to be all pet related items, and after moving to Wisconsin in 2015 I began to focus on the birds and changed the name of my shop to Birds of a Sweater. 2. Where do you get the materials (upcycled sweaters) used for the birds? I look for sweaters everywhere! I have family and friends that collect sweaters for me, I check resale shops, etc. I’m very picky about the sweaters I use because they have to be feltable (high animal fiber content) and not too thin or thick. 3. How do you choose which colors and materials to use together, and why is it important to you to use eco-friendly materials in your products? This is a tough one – sometimes I’ll have a beautiful sweater that I want to use for a bird, but no coordinating sweater to use for the wings and belly, and that sweater might sit in my collection for a few years waiting for a match to be found. We’re a very environmentally conscious family – we recycle, compost, grow a lot of our own food, so it’s important for me to keep as much garbage out of the landfills as possible. The best sweater finds for me are sweaters that are so damaged (holes, stains, etc.) that they will obviously never be worn again, but still have enough useable material to create my birds. 4. What is the process for creating each bird, and how long do they take to make? The sweaters first have to be felted. The bird pieces are cut out by hand (body, wings, belly, and beak) and then sewn together. Each bird is stuffed with fiber fill that is made from recycled water bottles and our organic catnip. Each eye is then needle felted onto the bird with black wool. I’ve honestly never timed how long they take to make! I usually make them in small batches of about 10 at a time. 5. Tell me about the organic grown catnip used in the toys. Why did you go this route rather than buying catnip? I used to buy all of our organic catnip. We moved to our small hobby farm two years ago, and that’s when I finally had room to grow enough catnip for all of my cat toys. We previously lived just outside of Chicago on a small 1/10 acre property where I had a small garden and a few chickens, but there wasn’t room for much else! Now we grow a lot of our own food and it just made sense to grow the catnip too. I love knowing exactly where it comes from and how it was grown. And our honey bees appreciate the blooms! 6. How did you come up with the idea for the kicker cat toys? I had been wanting to add a new item to my Etsy shop for a while, something that didn’t depend on my ability to keep sweaters in stock (sometimes I run low!) but still keep with the eco-friendly theme. The eco-canvas ended up being perfect to work with – it’s 45% recycled and is printed with water based, baby safe inks. 7. Tell me about donating 10 percent of sales to the feral cat colony. Why was this important to you, in addition to doing the TNR program? We inherited our small feral cat colony last year with a land purchase. We began TNR (and feeding and medicating, the cats were in poor shape) last winter. Previous to this I had no clue what TNR was or about the feral cat problem we have in our country. In addition to supporting the feral cat colony that we maintain (food, TNR, medical bills, etc.) with the sales of our items, I donate 10% of our sales to help feed other feral cat colonies across the US. Every month we use that 10% to send food via the Amazon wishlists of feral colony feeders. I know there are so many people out there doing this hard work all on their own, and food and medical bills can be overwhelming. Now that we’ve completed the TNR of our colony, it just feels right to use those extra funds and help out in this small way.